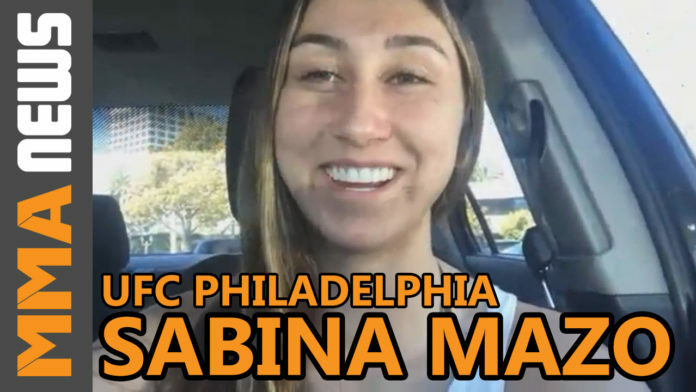 Former LFA flyweight champion Sabina Mazo will make her much anticipated UFC debut on Mar. 30 when she faces Maryna Moroz. The undefeated 21-year-old signed with the Las Vegas-based promotion back in December and despite a few months away from the cage she feels the timing of her first UFC fight couldn’t be better. Mazo (6-0) was born in Antioquia, Colombia but has fought her last four fights in the United States under the LFA banner. In April 2018 she captured the vacant LFA flyweight title – left by Andrea Lee when she signed with the UFC – defeating Shannon Sinn by unanimous decision at LFA 37. She’s now set to make her promotional debut against 11-fight veteran Moroz who will be moving up from the strawweight division. “The Colombian Queen” also has the advantage of training at one of the most prestigious gyms in the sport at Kings MMA. Mazo gets regular training with UFC lightweight Beneil Dariush, current LFA flyweight champion Maikel Perez and UFC middleweight title challenger Kelvin Gastelum. The Kings MMA standout believes fans can expect an action-packed fight and doesn’t see this fight going the distance. UFC Philadelphia will take place inside Wells Fargo Center in Philadelphia, Pennsylvania. The main event pits Edson Barboza against top lightweight contender Justin Gaethje.